Ministry of Finance is drafting the Circular on the collection, remittance, management and use of fees for issuing passports, Vietnam visa and papers on entry, exit, transit and residence in Vietnam. In the draft, Ministry of Finance proposed for passport fee to Vietnamese citizens from 100,000 - 400,000 VND. To specify, the fee for renewing passport is 200,000 VND. The fee for renewing for damage or lost is 400,000 VND. The fee for expanding passport is 100,000 VND. According to the draft, all levels of fee almost remain unchanged. For example, the Vietnam visa fee for issuing single-entry is 45 USD. The fee of issuing visa for tourists entering Vietnam for a short period remains at 5 USD. 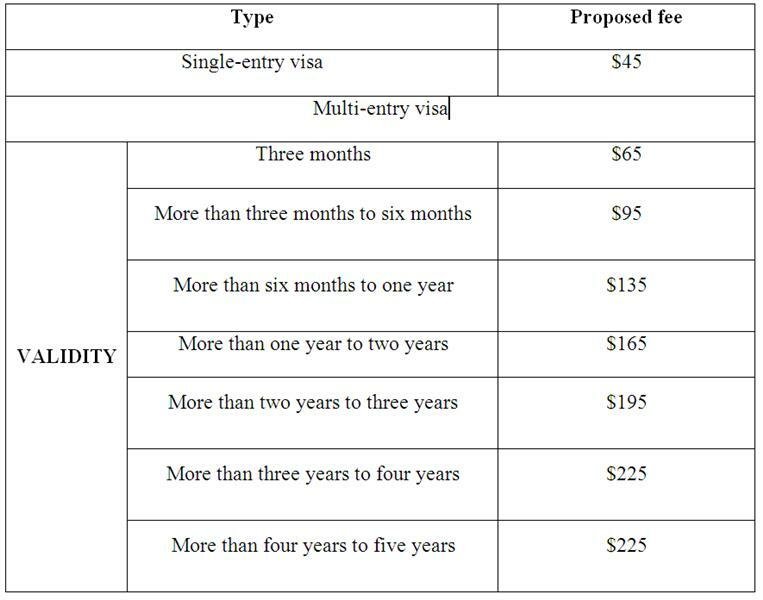 Issuing multiple-entry visa (up to 1 year) remains at 65 USD, 95 USD, and 135 USD, even the fee of 3 month multiple entry visa is considered to reduce. Some fees for visa to Vietnam are expected to increase due to the increase in duration of issuing time. The visa fee of multiple-entry with valid period of 1-5 years is from 165 USD to 255 USD. To the fee of renewing passport remains unchanged at 200,000 VND. To foreigners and Vietnamese people living abroad, the ministry proposed 45 USD for issuing single - entry visa, 65-255 USD for multiple-entry, depending on validity. The proposed fee of issuing visa for tourists is 5 USD/pax. Thus, compared with the current regulations, the rates for Vietnam citizens remain unchanged. The changes are seen in the rates for foreigners and Vietnamese living abroad. Particularly, the fee for issuing multiple-entry visa is divided into 7 levels, not 3. The highest level of 135 USD (for over 6 month visa) is proposed for increasing to 255 USD (visa with 4-5 year validity). 1. Invitee (spouse, children) of Party, State, Government or of Leaders of Party, State, Government, and National Assembly as individuals. 2. Officials and employees of diplomatic missions, consular offices abroad and representative offices of international organizations in Vietnam and members of their families (spouses and children under 18) , not being Vietnamese citizens of Vietnam and not residing in Vietnam, are exempted from the fee on the basis of reciprocity. 3. Foreigners holding diplomatic passports, official passports or ordinary passports issued by foreign countries and being exempted from visa fee in accordance with the Agreements between Vietnam and applicants' countries, on the basis of reciprocity. 4. Foreigners entering Vietnam to carry out relief or humanitarian assistance for Vietnamese organizations and individuals. 5. Those who are eligible for visa fee exemption under the specific decision of the Minister of Foreign Affairs, the Minister of Public Security, the Minister of Defense. These cases of being exempted from the fees prescribed above must have the "fee exemption" (GRATIS) in papers issued by fee collection agency.